Iris Zero 2 | Manga Reviews ~ Ramblings of A Fob. Ok I’m totally hooked to this series. I like the main characters so much, I like Toru and Sasamori. Sasamori’s infatuation towards Toru is adorable… It’s the irresistable Fluff. Rant aside, Iris Zero is still that “case to be solve series”. The second volume started off with Hijiri’s story and how he befriended Toru. Hijiri’s Iris ability enables him to see if a living thing is nearing death. In their last year of elementary, Hijiri has been invited by a girl named Katagiri to attend a tutoring class. There he met Tachibana Satsuki, a happy, free spirited girl and found himself being infatuated by her. Tachibana has the power to determine a person’s happiness based on the form of flower. Things were looking good but suddenly Hijiri saw a black butterfly appeared on her, meaning she’s near her toll. Hijiri decided to look out after Tachibana, though as days passed the number of black butterflies kept increasing. It affected Hijiri so much to the point that he tried to put an end to his own life. Good thing Toru was there to bring Hijiri to his senses when he tried to kill himself. Toru decided to help Hijiri solve the mystery of Tachibana’s fate. It turned out that the Katagiri girl is plotting a terrible scheme towards Tachibana out of jealousy. Katagiri has the power to see an upcomming danger. Thanks to Toru’s keen observation of details, awesome deduction they managed to get Tachibana away from danger. Because of that Toru and Hijiri became good friends. Half of the series spends on the cultural activity around school. Another case was presented involving a missing outfit. The new girl that was introduced in the first volume was given some spotlight as well. 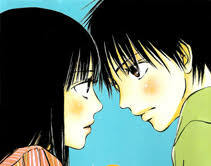 We learned that she is Kuga Nanase, who have a crush on one of the sort of popular guy. She is a quiet girl who has the ability to see peoples emotions based on the color of their wings that she can only see. I loved the ending. I don’t care so much about the cases, I’m up for the romance. This volume contained a very charming scene. The missing outfit belonged to Sasamori, a Hakama to be exact. By the end of the volume it was returned to Sasamori, she wants Toru to see her wearing it. Oblivious of Sasamori’s intention and feelings Toru didn’t realize that Sasamori had sort of confessed to him. It was just darn cute and fuzzy. The omake at the end was still one of my favourite things about the series. They were hilarious. Toru likes sweets, especially cakes, this one particular shop sells a decadent cakes but only to female customers. Toru sees Sasamori passing by and he invited her to get a drink. He gets what he wanted, the cake. Of course Sasamori thought of it as if they were dating. I love, love, love it. I like how the characters makes fun of Iris Zero itself. These extras alone should not be missed. The writer’s sense of humour in this omake is priceless. Iris Zero is continuing to be a delight. Please license this ASAP.